Hardback. SIGNED BY BOTH AUTHORS. Crime was Britain's fastest growing industry. At time of publication, it cost Britain's taxpayers more than £500 million a year and yet 7 out of 10 of all crimes committed remained unsolved. Who was to blame for this situation? Were British police as wonderful as every visitor to Britain would have us believe? Were British law-makers men of wisdom and foresight? Did judges and magistrates in Britain help to deter law-breakers? Were the probation officers and the so-called 'do-gooders' too soft? 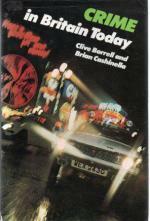 In this challenging view of crime in Britain in the 1970s, two experienced Fleet Street journalists drew on their years of reporting crime to answer these disturbing questions. Chapter headings include : Police; Violence; Juveniles; The Gentle Art of Fraud; Security Against Thieves; Smuggling, Vice and Drugs; Terrorism; Royal Ulster Constabulary; Forensic Science and the Home office; Courts, Law and Prisons; Coroners. Illus. 205pp. 8vo. h/back. 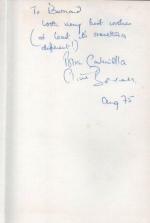 PRESENTATION COPY INSCRIBED BY BRIAN CASHINELLA AND SIGNED BY BOTH AUTHORS. V. lightly browned edges o/w Nr. F. in Vg. dw.